Whether you’re off to work, school, or on the trip of a lifetime, the reliable Cruzer® Dial USB flash drive lets you take photos, files, and music wherever you go. 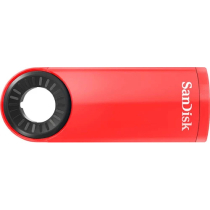 Turn the dial on the flash drive to open and close the protected connector and all your files are at your fingertips. Plus, with the included SanDisk SecureAccess software(2), you get password protection and encryption, so you can keep your private files private while leaving the rest of the drive available for sharing. With its unique dial to open and close the retractable connector, the Cruzer® Dial USB flash drive offers reliable USB storage and a design that’s both handy and handsome. Create a private folder on your drive with SanDisk SecureAccess software(2). This 128-bit AES encryption software makes it easy to password-protect critical files. Drag and drop files into the vault, and they'll be protected. (1) 1GB = 1,000,000 bytes. Actual user storage less. (2) Password protection uses 128-bit AES encryption and is supported by Windows Vista®, Windows® 7, Windows 8, and Mac OS X v10.6+ (Software download required for Mac, seewww.SanDisk.com/SecureAccess) (3) For more information, see the Warranty and User Guide page. • Warranty: 2-year limited warranty.